May Robson was one lucky lady. She had been acting since she was 25 (in 1882), then started doing movies on a regular basis in 1927 (when she was 69), so she is perhaps the only actor of her generation to have her performances to any large degree to have been captured on celluloid. You are sure to have seen her — during the 1930s, she was almost always playing gruff, impatient old biddies, masking a real warmth underneath. Born into a rather colorful family, Mary's father died when she was only two. Her mother remarried; the family was moved to London by 1870. She was educated in England, but studied in France to learn the language. However, at the age of seventeen, she ran way, not to the circus, but to get married to 18 year-old Charles Leveson Gore, who promptly set up as a cattle rancher in Fort Worth, Texas. The ranch only lasted two years. They sold what they had and moved to New York City, but Gore perished of a fever there. Alone with three children to feed, Mary did needlework and taught painting to make ends meet. Two of her children died. The remaining child, son Edward Gore, would become his mother's business manager. In 1883, Robison landed a role in Hoop of Gold at the Brooklyn Grand Opera House. In the program, her name was misspelled "Robson," but she decided to keep the name as a good luck charm. Must have worked — Robson became a well-known actress and comedian with the Charles Frohman Theatrical Syndicate. She played Mrs. Prism in the Broadway premiere of The Importance of Being Ernest in 1895; it flopped. She was convinced to appear as herself in the film How Molly Mallone Made Good (released in October 1915). She then appeared in an adaptation of a play she had co-written and starred in, which, for the movies was given the title: A Night Out (released in January, 1916). The play she had written was called The Three Lights. By the time May returned to the cameras, she was playing a part in Cecil B. DeMille's King of Kings, which opened the Chinese Theatre in May, 1927. Robson was already great friends with Sid Grauman; she took out a full-page ad in the opening night's program. Robson always made an impression, whether playing the lead or in supporting roles. Some of her better-known films include: Strange Interlude (which played the Chinese in July, 1932), If I Had a Million (released in November, 1932), Dinner at Eight (which played the Chinese in August, 1933), and Frank Capra's Lady for a Day (released in September, 1933) for which she was nominated for the Best Actress Oscar, and Anna Karenina (played the Chinese in October, 1935). 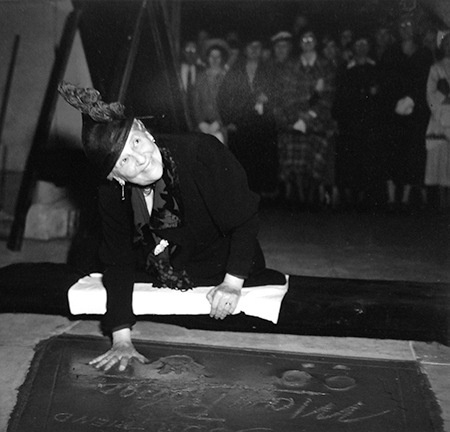 One of Robson's indelable performances is as Esther Blodgett's granny in the original A Star Is Born, which was premiered at the Chinese just two days prior to her Forecourt ceremony. At the end of the film, Robson even makes an appearance at the Chinese for a premiere of her m ovie granddaughter's new film. Although Robson and Fredric March were in the film, they shared no scenes together, and so they were given separate Forecourt ceremonies. She played Aunt Polly in The Adventures of Tom Sawyer (released in February, 1938), was one of the house guests in Bringing Up Baby (released in February, 1938), and played Aunt Etta to the Lane Sisters in Four Daughters (August, 1938), Four Wives (released in December, 1939), and Four Mothers (released in January, 1941). Her last film was Joan of Paris with Paul Henreid (released in January, 1942). 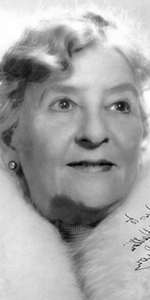 Robson died at her home in Beverly Hills in 1942, from the complications of old-age, at the age of 84. Grauman's Chinese Theatre, Hollywood, California. May Robson Forecourt ceremony, Thursday, April 22, 1937. May Robson makes her mark.